There was no practice rink. No attention-grabbing ads. And, there were no players. Just a small office on Lane Avenue and four Hoosier natives (David Paitson, Alan Karpick, Brent Mauer and Larry Lane) a dream: Making pro hockey a winner in Columbus, Ohio. For 14 years the city had gone without pro hockey. The Chill followed three previous minor-league hockey failures: Checkers, 1966-1970; Seals, 1971-73 and Owls, 1973-77. This time would be different. In 1991 Central Ohio caught hockey fever. A new East Coast Hockey League franchise – the Columbus Chill – sparked a cultural phenomena, creating a wave of community excitement and new realm of possibilities for professional sports in Columbus. With just 100 days between the public announcement of the team and its first home game the Chill exploded on the local sports scene. In their first season crazy promotions, borderline offensive print ads and biting radio and TV commercials caught everyone’s attention, including the national media with stories from The Wall Street Journal, Hockey News and ABC World News Tonight. Initially, team officials had hoped to draw 3,500 patrons per game. However, team officials soon realized their marketing strategy was a breath of fresh air that captured the city’s imagination. The Chill was quickly dubbed “The Hottest Game in Town” by The Other Paper, “Mardi Gras Meets High Sticking”, by Columbus Alive and the “World’s Largest Dorm Party” by Columbus Monthly. A sellout streak started in January, 1992, just two months into that inaugural season, and did not end until 83 games later — a minor league hockey record that stood for a decade. Capitalizing on the phenomenon, in year two the Chill built its season ticket base to more than 5,000– and the base would grow to 6,500 full and partial season ticket holders in season four. 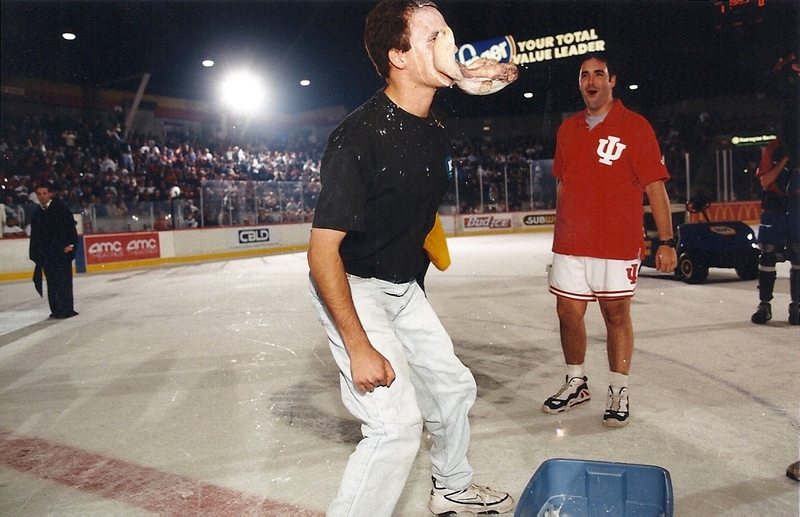 The excitement of the Chill made pro hockey a major player on the Columbus sports scene. However, just as it looked as if the Chill was on top of the world the team was blindsided by Fairgrounds officials. Scheduling conflicts with the Chill’s home building, the Ohio Expo Fairgrounds Coliseum, made it extremely difficult to obtain sufficient home dates for the coming season and threatened to turn the Chill into a one-hit wonder. The conflict nearly forced the Chill to leave town. The Chill took the issue public, unleashing a public outcry and calling upon fans to apply pressure on public officials and the media. Columbus Mayor Greg Lashutka reached out to Chill President and General Manager David Paitson offering his services. With the Chill fans fully engaged, the conflict sparked enough public fury that Mayor Lashutka announced plans to form a “Citizen’s Commission” to “to study “how and where a sports/civic arena might be built in Columbus.” The mayor cited that “the difficulty the Columbus Chill had in nailing down dates for their coming season was one of the reasons we’ve decided to appoint a citizens commission to study how and where a sports/civic arena might be built in Columbus” (Columbus Dispatch , September 11, 1992). Shortly thereafter, with the mayor’s assistances three events – Dispatch Sport, Vacation and Travel Show, the Buckeye Gymnastics Classic, and the Scott Antique Market – shifted dates or venues to make way for the Chill dates. The solution satisfied both the East Coast Hockey League and the Chill ownership. At the start of the third season the sellout streak was well known in hockey circles. The season ticket numbers were staggering for a minor league franchise. But the most accurate barometer of the impact of the Columbus Chill was the consistent talk among local media and civic officials of building an arena and the possibility of getting an National Hockey League expansion team. While the arena and the NHL continued to just be a dream, a more immediate result of the Chill’s presence was felt with the opening of the Chiller in Dublin, the team’s $3.4 million practice facility. The two new ice surfaces increased the number of permanent rinks in Columbus to three and started an unprecedented growth in both youth and adult hockey. The Chill became the first minor league hockey team in history to own and operate its own ice facility. On the ice the Chill began to make the kind of progress die-hard hockey fans had been craving. After missing the playoffs during its first two seasons, head coach Terry Ruskowski put together one of the most talented teams in franchise history. The team’s 41-20-7 mark was good enough for a second place finish in the North division qualifying the Chill for its first post season appearance. Interest in the team soared to new heights by the season’s end. So much so that WCMH-TV (NBC 4) interrupted their prime time lineup to televise the Chill’s first home playoff game, an unheard of feat in minor league sports. Columbus Monthly would name the Chill “the best sporting event in Columbus” in 1992 and again in 1993. 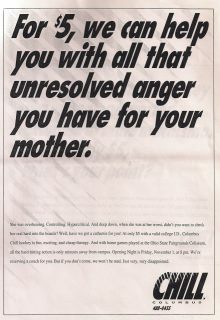 In 1994, Central Ohio Chapter of the American Marketing Association recognized the Columbus Chill as the Marketing Project of the Year. Two years after the Coliseum scheduling fiasco, and a year after the formation of Mayor Lashutka’s Citizens Commission, a downtown arena feasibility study from the Chamber of Commerce is unveiled. The study stated that with the Chill as the main tenant, the facility would break even financially. Chill president David Paitson was a featured speaker at the press conference endorsed the facility and verbally committed the Chill to play in the proposed arena. Paitson then joined Franklin County and city of Columbus officials in the next steps in the arena and stadium process. The Multi-Purpose & Sports Facility Work Group formed by Mayor Lashutka and the Franklin County Commissioners, included two representatives each from the Chamber of Commerce, Franklin County Convention Facilities Authority (Convention Center), City of Columbus, Franklin County and two private businessmen Doug Krider of CAPA and the Chill president and general manager. On the ice, a changing of the guard at head coach took place as Moe Mantha took control. Ruskowski, the team’s head coach for its first three seasons, became the first ECHL coach to be hired as the head coach in either the American Hockey League or the International Hockey League. Ruskowksi’s promotion was to the Houston Aeros of the IHL. Mantha’s selection was just another example of how much the credibility of the franchise had attained in just three years. A former NHL’er of 12 seasons and an assistant captain for the 1992 U.S. Olympic team, Mantha was selected from 75 candidates, many of whom had NHL playing and coaching experience. Mantha’s 1994-95 and 1995-96 teams made the playoffs. In his first year the team again had facility problems having to travel to Troy, Ohio to play its home playoff games. By this time the Chill’s scheduling problems were an old story. One column printed in the Columbus Dispatch at the end of the 1994-95 campaign read “Chill woes underscore need for arena in city” (March 28, 1995). When the Chill opened practice to start its fifth season they became the first pro hockey team in Columbus to make it to a fifth season. The city’s love for hockey could no longer be written off as a fad or trend. When the Chill came to central Ohio in 1991 there was one youth hockey group, Capital Amateur Hockey Association (CAHA) with 150 players and six adult league teams. At the start of year five there were three youth organizations. CAHA already had enrollment of about 350. 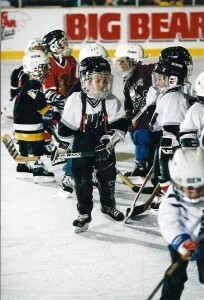 At the two-year old Chiller ice facility the Columbus Chill Youth Hockey Association (CCYHA) had over 400 participants. The Newark Youth Hockey Association expanded from 50 to 200 kids. In five years the area had seen youth hockey participation increase from 150 kids to over 950. During that same period adult hockey climbed from six teams to more than 50. While unable to maintain the sellout streak into the fifth season, the team sold out 27 of 35 dates and entertained fans to 98 percent capacity crowds. In the community the effort to build an arena and obtain an NHL franchise had gained a tremendous amount of momentum. 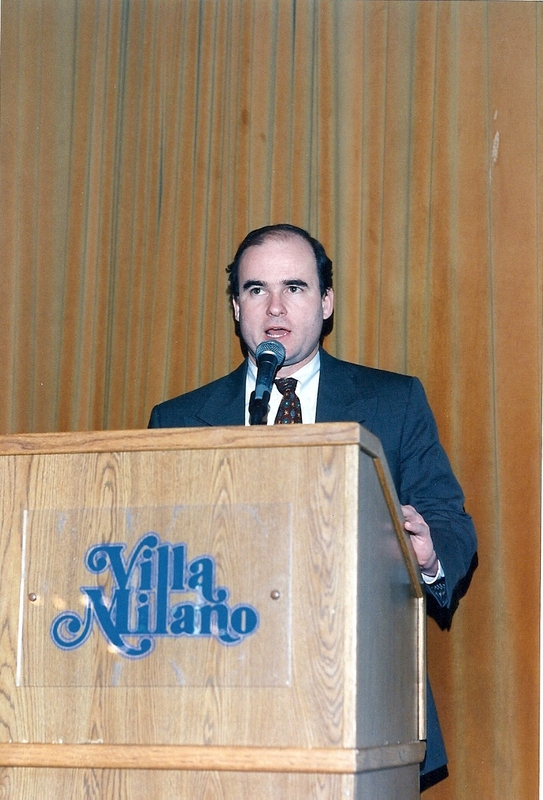 In June, 1996, seven representatives from Columbus including Chill President and General Manager David Paitson meet with NHL Commissioner Gary Bettman in New York to discuss expansion. 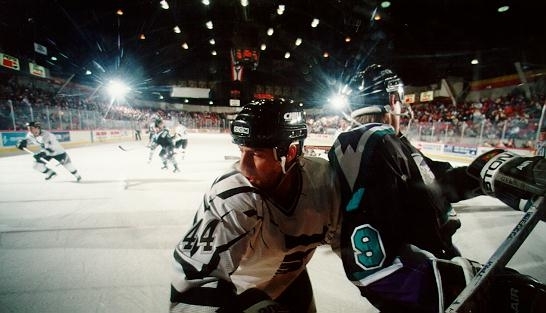 Entering the 1996-97 season, the Columbus Chill had gone from a startup project to serving as one example why NHL hockey would prosper in the city. The city formerly applied for an NHL expansion franchise that year and successfully lobbied to get an arena and stadium referendum on the May ballot of 1997. Internally the Chill would again go through coaching changes. Mantha was hired by the AHL’s Baltimore Bandits (the Bandits would later move to Cincinnati renaming themselves the Mighty Ducks). The new coach for the Chill in year six would be Brian McCutcheon. The former captain of Cornell’s 1971 NCAA Championship team (the only undefeated team in NCAA history) McCutcheon later guided the Big Red as head coach. He spent just one season in Columbus…but what a season. McCutcheon led the Chill to a franchise-best 44-21-5 record and a North Division title. It was the city’s first-ever division championship. McCutcheon was named ECHL Coach-of-Year. 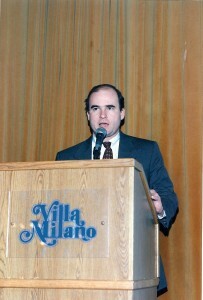 David Paitson, the team’s President and General Manager was named Executive-of-the-Year. In April, 1997, the Chill and Columbus Blue Jackets owner John McConnell joined forces and signed a deal to build a second Chiller in the Easton Market area. The team’s regular season success afforded them home ice advantage but due to scheduling conflicts the Chill was forced to play their home playoff games outside the Fairgrounds Coliseum. Once again the Chill’s scheduling conflict became an public issue and supported the argument for the pending arena/stadium referendum. 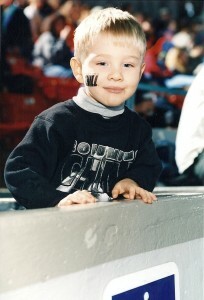 Over the course of the 1996-97 season supporters of the referendum often used Chill games as a forum to lobby for support. In spite of a record turnout at the ballot box, Issue One was defeated at the ballot on May 6, 1997, just days before the NHL was to announce its decision on expansion. Three days later, the NHL granted Columbus and other expansion city hopefuls more time to resolve their arena problems. With the city’s NHL effort in doubt, a contingent made up of local business leaders including Columbus Mayor Greg Lashutka, Dimon McFerson of Nationwide Insurance, and John H. McConnell of Worthington Industries, step up to privately build a $125 million arena and secure the NHL expansion franchise. With the start of the 1997-98 season, the NHL looming and the Chill entering its seventh year, speculation of the franchise’s future became a topic of conversation among the public. Nevertheless, the Chill would continue to lead by example. 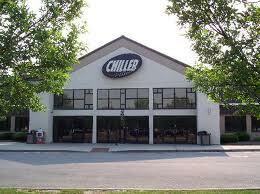 In December, 1997 the Chill opened the Chiller Easton. The new building would be built with the with financial support of JMAC (owned by John McConnell the majority owner of the Columbus Blue Jackets) increasing the number of ice sheets in Columbus to five. The Chill became one of two professional teams in North America to co-own and operate two ice facilities. 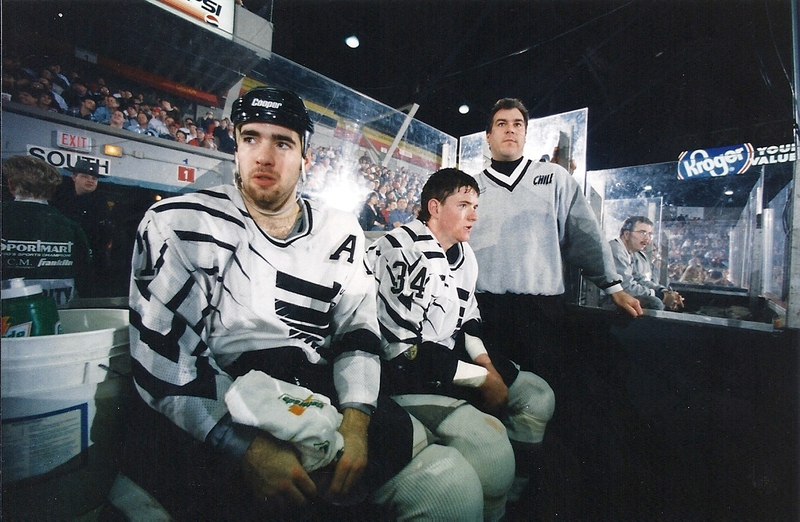 Also, prior to the seventh season Brian McCutcheon became the third Chill coach to make a direct jump to either an IHL or AHL head coaching job. He was hired by the Buffalo Sabres to coach their farm club, the Rochester Americans of the AHL. At the end of its existence in 1999, the Chill promoted more coaches to the IHL or AHL than any other ECHL franchise. With McCutcheon out, in came Don Granato, the fourth and final Chill coach. Granato was a former player with the Chill during the team’s first two seasons and came from a rich family hockey history. His brother Tony was at the time a star player with the San Jose Sharks and sister Cammi captained the 1998 gold medal winning USA Olympic women’s hockey team. Don brought championship experience, winning back-to-back titles in the USHL, and a strong reputation for player development. The Chill would have one more major promotional trick left in its bag. In what has become Columbus hockey folklore, the Chill created the ultimate bait & switch promotion. With the new NHL expansion franchise underway with a million dollar advertising campaign attempting to sell Personal Seat Licenses to “Day One” buyers over a 30-day window (October 15 to November 15) the new team planned on unveiling its nickname just before the mid-November deadline. The NHL ultimately would require each expansion franchise to secure a minimum of 12,000 season ticket holders. The Chill would capitalize on the intensity of the excitement of the NHL nickname announcement, as Chill President David Paitson conceptualized a strategic misdirection. Opening Night was schedule for Halloween. The Other Paper had facetiously suggested the Mad Cows as the NHL nickname. Paitson, fascinated and entertained by the alternative newspaper’s tongue-in-cheek campaign, decided to bring the idea to life for one game. Paitson secretly approached the Publisher Max Brown and staff to play along with the gag. 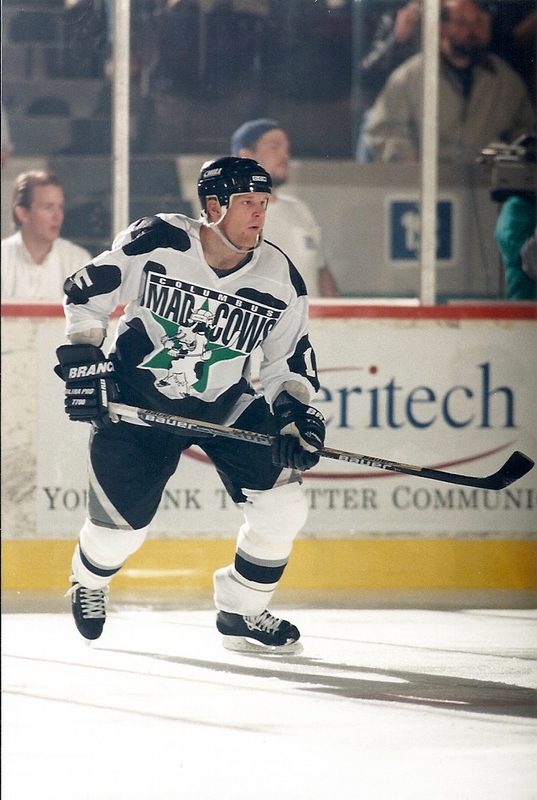 In the spirit of Halloween, the Chill would “change costumes” and be transformed into the Mad Cows for Opening Night. Keeping the concept to a very tight circle, Paitson, at 4 p.m. on Monday of the season opener, issued a one line press release stating that there would be a press conference on Thursday – one day before Opening Night – “to announce a team name change.” The release caught the media completely off guard. Paitson and PR Director Gary Kohn received a flood of media calls, but refused to offer any additional information – counter to the Chill’s normal open style – until the Thursday press conference. The media was hooked and speculation ran rampant. The prank fooled everyone into assuming the Chill was changing its name in order to free up the Chill name for the NHL expansion franchise. Although the Chill never as much as hinted at that possibility, the media in their enthusiasm to be the first to unveil the new NHL team nickname rushed to judgment, making the claim that the NHL team nickname would be the Chill – just as the Paitson had not only anticipated, but had hoped. In the ensuing days the Chill delivered cow bells, meat and milk to the media to hint at what was coming with the Thursday announcement. The press conference included the unveiling of the Mad Cows jerseys worn by players Matt Oates and Mark Turner. The prank created the water cooler talk and speculation leading up to the opener, helping ensure another sellout. Opening Night would be transformed into the “Meadow of Doom” with hundreds of fans in costume, a 40-foot inflatable cow at a pre-game party, and an intermission contest where fans dunked for cow tongues. The promotion not only helped the Chill to a sellout, but had delivered even more attention and interest in the NHL team nickname announcement that occurred 10 days later. On September 24 1998, the Chill announced the franchise had been sold and the 1998-99 season would be the last in Columbus. After seven profitable seasons, the Chill’s seven figure sale was just another case of the team’s booming business success. Despite their swan song, the Chill franchise maintained one of the best shows in sports. Its final season, themed “Last Call” the Chill recognized Columbus hockey past by honoring the former Columbus hockey teams (Owls, Checkers, Seals) and naming an All-Time Chill Team (defensemen – Lance Brady, Barry Dreger, Forwards – Derek Clancy, Jason “Smurf” Christie and Rob Schriner, Goal Tender – Jeff Salajko, and Enforcer – Phil Crow) were just a few of the special promotions executed throughout the year. But, of the many special moments during the final Chill season none was more magical then the team’s final regular season game. In a perfect blend of showmanship and gamesmanship the Chill won their second division title in three years defeating the Dayton Bombers 5-0. In the franchise’s 191st and final sellout, Chill fans did not go home disappointed. For eight years the Chill franchise made hockey history in Columbus. Its impact continues to be felt. Major league sports made Downtown Columbus vibrant and relevant once again. The economic impact is far beyond anything imagined when presented to the voters in 1997 and certainly beyond any dreams of a fledgling minor league team announced six years earlier. Nationwide Realty, Inc. has overseen nearly a billion dollars of development in this once blighted area and the Arena District has generated $30 million in additional tax revenue each year since the outset with expectations of $60 million as the calendar turns to the second decade of the 21st century. With the launch of the NHL Blue Jackets, annual sales by Arena District businesses rose from $78 million in 2000 to $1.6 billion in 2006. Columbus Public Schools directly benefited by receiving a check of more than three-quarter of a million dollars annually from ticket surcharges on Nationwide Arena events and visiting players taxes. The total resulting financial impact on the city is in the billions of dollars and its social impact was in a word priceless. Without the Arena District project the triple-A baseball Columbus Clippers wouldn’t be flourishing at the new Huntington Park. The Chill’s management and ownerships decision to invest its time and resources in the building, programming and managing of the Chiller ice rinks led to an explosion of skating and hockey activity in Central Ohio. The Chill organization led the effort to build the largest ISI skating program in the United States and expand hockey participation tenfold. In the ensuing years the Chiller’s produced Division I collegiate hockey players, NHL draftees, and USA National and Olympic figure skater Marcy Hinzman. The Chill legacy lives on.